13-day workshops: students will be housed for 12 nights in double-occupancy hotel accommodations, unless otherwise and previously specified. Ground transportation will be provided between the Pisa airport, Pietrasanta or Viareggio train station, and the students’ lodgings on the arrival and departure dates. Transportation will also be provided between lodgings and Montorno studio on all class days, as well as on the several scheduled field trips. 8-day workshops: students will be housed for 7 nights in double-occupancy hotel accommodations, unless otherwise and previously specified. Ground transportation will be provided between the Pisa airport, Pietrasanta or Viareggio train station, and the students’ lodgings on the arrival and departure dates. Transportation will also be provided between lodgings and Montorno studio on all class days. Round-trip ground transportation between Pisa airport, Pietrasanta or Viareggio train station, and the students’ lodgings. 13-day workshops: 12 nights accommodations (double occupancy); daily breakfast (at the hotel); 8 lunches; 9 dinners; 8 days of drawing, painting, or sculpting instruction (model fees and use of an easel are included); daily group transportation to and from workshops; ground transportation for scheduled day trip per workshop class. 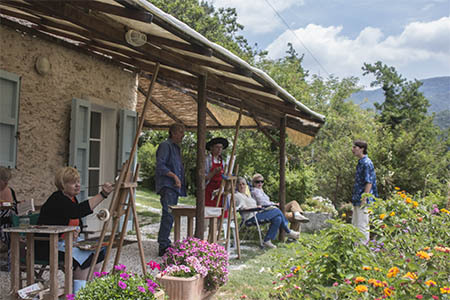 8-day workshops: 7 nights accommodations (double occupancy); daily breakfast (at the hotel); 5 lunches; 6 dinners; 5 days of drawing, painting, or sculpting instruction (model fees and use of an easel are included); daily group transportation to and from workshops; ground transportation for scheduled day trip per workshop class. Airfare. Insurance. Drawing, painting, or sculpting materials (stretcher bars, solvents, and sculpting clay may be purchased upon arrival); lunch and dinner during day trip; lunch and dinner on free days; phone calls; personal items. A limited number of single-occupancy accommodations are available for an additional fee. A companion fee, not including the drawing or painting instruction, is also available.